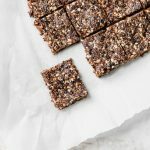 These raw fig bars come together in minutes and require just 5 ingredients and a food processor to make! Place walnuts, almonds, figs and cacao into a food processor; pulse until mixed. Then, with the motor still running, pour maple syrup in through the top. This should help everything to come together. Pour into a medium-sized bowl; add maple syrup and stir. Line an 8×8 dish with parchment paper, then scoop mixture into the dish, using a spatula to press down and smooth everything out. If mixture it too sticky, spray spatula with nonstick spray (that usually does the trick for me!). Place dish into the refrigerator for at least an hour; cut into bars and enjoy!